Liz Wiggins’ paper on the radiocarbon content of aerosols from Indonesian fires was published yesterday in PNAS. Colleagues from the National University of Singapore (NUS) and the Singapore-MIT Alliance for Research and Technology collected aerosol samples from the NUS campus in downtown Singapore during 2014 -2016 and sent them to Liz at UCI for chemical and radiocarbon analysis. The observations show that the smoke clouds reaching Singapore during the El Nino-induced drought of fall 2015 had a mean age of 800 years, confirming in a novel way that almost all the fire emissions originated from peat. Several recent fire inventories and budget estimates had concluded that other non-peat sources may have been important, but our work indicates that these sources were likely very small. Much of the fire emissions in the region originates from trees that were alive during the Middle Ages, when Marco Polo was traveling by Singapore on his way back to Europe. Liz is now a Postdoctoral Fellow at NASA Langley, graduating with her Ph.D. from UCI in August 2018. Why do model predictions indicate the Amazon will get drier but Indonesia will get wetter? In most climate model projections for the 21st century with moderate to high fossil fuel emissions, the Amazon becomes drier and Indonesia becomes wetter. 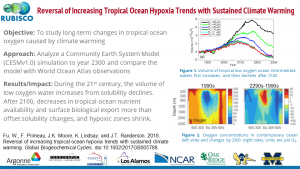 Within the climate modeling community, this pattern of diverging tropical land precipitation had been attributed to the radiative effects of atmospheric carbon dioxide that influences ocean temperatures and atmospheric circulation. In a new analysis published in Nature Climate Change, Kooperman et al. show that the direct effect of rising carbon dioxide on tropical forests is responsible for much of this pattern. In response to rising CO2, plant stomates close, causing more absorbed radiation to dissipate in the form of sensible heat and less in the form of latent heat. In the Amazon, these changes in the surface energy budget suppress precipitation across lowland forests within the models, allowing more moisture contained in the tropical jet flowing from the Atlantic to reach the Andes. In Indonesia, greater sensible heating on land triggers a stronger land-sea breeze and moisture convergence over the islands of Sumatra and Borneo. This work suggests neotropical forests may be more vulnerable to climate warming, as they will have less available soil moisture to evaporatively cool. Higher levels of rainfall in Indonesia may make it easier to conserve tropical peatlands, but other important land management steps must be undertaken, including restoration work to remove canal networks. Weiwei Fu’s paper published this week in Global Biogeochemical Cycles shows ocean oxygen minimum zones are poised for a wild ride over the next few centuries. First they will expand from warming, but then they may shrink far below current levels. 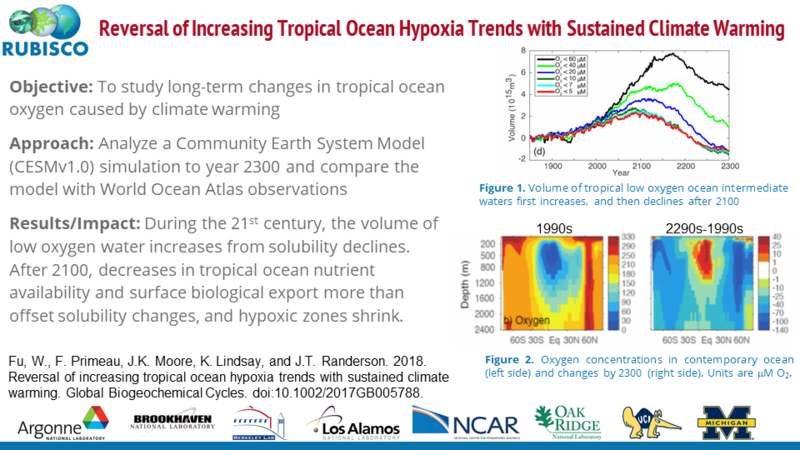 Recovery of oxygen after 2200 does not necessarily bode well for ecosystems: the reversal in the hypoxia trend is driven by loss of nutrients from surface waters and decreases in marine productivity well below contemporary levels. The O2 recovers because the tropical ocean biosphere becomes more like a desert. This work is a nice illustration of a biological tipping point (one we don’t want to cross) and the value of exploring Earth system changes in deep future time! Shane Coffield, a first year Ph.D. student in Earth System Science, was awarded a 2018 NSF Graduate Research Fellowship. Shane proposes to work on fire prediction and participates in the Machine Learning in Physical Sciences (MAPS) NSF training program. Congratulations to Shane for this prestigious award! I am looking to hire 1-2 Ph.D. students and 1-2 postdoctoral scholars in my laboratory during 2018 and 2019. For Ph.D. students, I am particularly interested in working with students on research topics related to the global carbon cycle and analysis of land cover change using land surface modeling and remote sensing techniques. For postdoctoral scholars, I plan to hire someone in the area of high resolution terrestrial remote sensing. I also wish to hire someone interested in studying global carbon and water cycles using earth system modeling and data science approaches. I particularly encourage women and underrepresented minority candidates to contact me and apply for these positions!